Signed into law in 2002, the federal No Child Left Behind Act (NCLB) promised to revolutionize American public education. Originally supported by a bipartisan coalition, it purports to improve public schools by enforcing a system of standards and accountability through high-stakes testing. Many people supported it originally, despite doubts, because of its promise especially to improve the way schools serve poor children. By making federal funding contingent on accepting a system of tests and sanctions, it is radically affecting the life of schools around the country. And they put forward a richly articulated vision of alternatives. 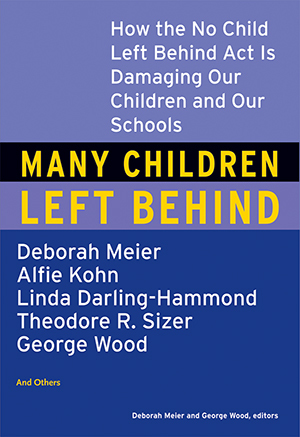 Educators and parents around the country are feeling the harshly counterproductive effects of NCLB. This book is an essential guide to understanding what’s wrong and where we should go from here. The editors and contributors are all highly respected experts in education and founding members of the Forum for Education and Democracy, a nonprofit organization for social change.